Snoring? Waking up breathless? Feeling tired all the time? Disturbances to our sleep can have detrimental effects on our day to day life. There are many conditions, medical and non-medical which can disrupt our own sleep as well as those sleeping next to us. Sleep is essential to our health and well-being, emotionally as well as physically. A common condition called sleep apnoea also spelt sleep apnea can cause a range of different symptoms which can disturb sleep. Sleep apnoea is where the muscles in the mouth and throat relax during sleep and the airway can become blocked by the tongue, uvula, tonsils or simply by throat tissue. This can affect anyone and is usually affected by anatomy, although being overweight, smoking or alcohol consumption can attribute to this. Snoring, Sleep Apnoea or similar conditions can inhibit your body from falling into a deep sleep, this can cause chronic fatigue, heightened emotions as well altering activity in the brain. More seriously, risks of high blood pressure, diabetes and cardiovascular diseases through sleep deficiency. Sleep Apnoea affects millions of people and is widely undiagnosed. Reoccurring dry mouth after waking up. Scroll down for more information on our diagnosis using the RU sleeping RTS device as well as how the OrthoApnea is a multi-solution device. Sleep APnoea affects millions of people and is widely undiagnosed. If you are suffering from chronic fatigue, it could be more than just a few bad nights sleep. At the Brighton Implant Clinic, we can provide you with a device which can analyse your sleep in the comfort of your own home. The RUsleeping RTS is a small device which monitors your respiratory patterns once you fall asleep. This can detect and record that is called an apneic episode. 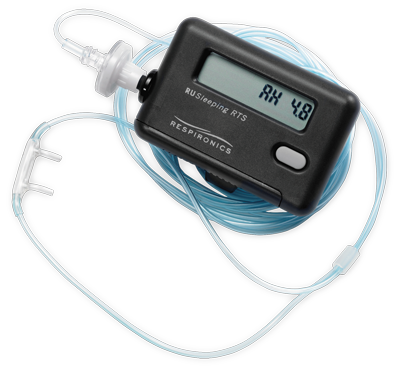 The R U Sleeping RTS is a nasal cannula and a small battery pack with a screen. This small device can be attached to you, your clothing, placed beside you in bed or on a pillow. The device begins recording once there is a change in pressure from the inhaled airflow through the nasal passage. The device can detect an apneic episode, which is if your breathing decreases by 50% or more for more than 10 seconds. All of these results will be recorded on the device. This recorded information can be sent electronically, such as via email or to a mobile device which can later be discussed with one of our dentist's. Multiple solutions to various problems such as Sleep apnea, occlusal pathology, snoring and more. OrthoApnea is manufactured to ensure a perfect fit for each patient. Laterality, opening and millimetric controlled advancement. It allows all types of movement its usage. Rigorously tested under the supervision of specialists in Sleep Medicine. Based on a controlled and comfortable mandibular advancement during its usage.